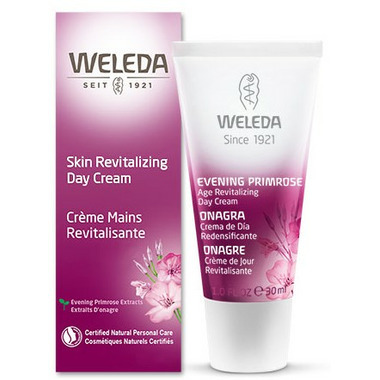 Weleda Skin Revitalizing Day Cream is a day cream for daily use on mature skin. Evening primrose oil makes your complexion appear strengthened and firmed with intensive moisturization to mature skin. Leaves skin looking plump and refreshed and increases the look of resilience. Skin appears firmer, facial contours are visibly more defined and the look of wrinkles reduced. Vegan, clinically-tested for efficacy and skin-tolerance. Free from synthetic preservatives, fragrances, colorants, free of raw materials derived from mineral oil. Ingredients: Water (Aqua), Sesamum Indicum (Sesame) Seed Oil, Alcohol, Macadamia Ternifolia Seed Oil, Isoamyl Laurate, Glycerin, Cetearyl Alcohol, Glyceryl Stearate Citrate, Olea Europaea (Olive) Oil Unsaponiables, Theobroma Cacao (Cocoa) Seed Butter, Plukenetia Volubilis Seed Oil, Hamamelis Virginiana (Witch Hazel) Distillate, Oenothera Biennis (Evening Primrose) Oil, Centella Asiatica flower/Leaf/Stem Extract, Althaea O cinalis Root Extract, Acacia Senegal Gum, Chondrus Crispus (Carrageenan) Extract, Xanthan Gum, Glyceryl Caprylate, Arginine, Fragrance (Parfum)*, Limonene*, Linalool*, Benzyl Benzoate*, Benzyl Salicylate*, Geraniol*, Citral*, Farnesol*. I love all Weleda skin care products! Simply natural, organic, and proven....without animal testing. My main go to skin care line. I really like the gentleness of this cream, as in all weleda products. It absorbs well but I do not find it moisturizes enough even in the summer. After a few months of use I still love the cream, but during the winter months I found it wasn't always rich enough for my dry and sensitive skin. I really like this cream. My skin feels great and very hydrated when I put it on.